During the last five months, a number of new flagship phones have been launched successively, including many Snapdragon-845 powered phones, and we've had a couple of new entries into our top 10 best performance Android phones list including Mi Black Shark and OnePlus 6. Who has won the performance crown of May? Today Antutu reveals our benchmark results for the 10 best performance Android phones for May 2018. Come and check with us. 2. Period of data statistics: May 1, 2018 to May 31, 2018. In order to give you better reading experience, we have optimized the way we name some of the models on the list. 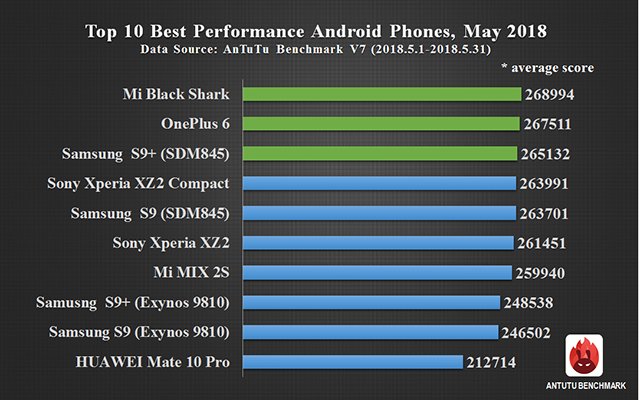 According to our most updated ranking list, Mi Black Shark replaced Samsung S9+ (SDM845/G965U) to be the best performance Android phone of May with an average Antutu score of 268,994. Mi Black Shark is a gaming phone invested by the famous Chinese phone maker Xiaomi. It is powered by Qualcomm Snapdragon 845 mobile platform and offers two alternative memory combinations of 6GB of RAM/64GB of internal storage and 8 GB of RAM/128 GB of internal storage. The flagship-level processor plus large memory, along with an integrated liquid cooling system laid solid foundation for its strong performance. The newly launched OnePlus 6 ranked second with an average Antutu score of 267511. This model is also powered by Snapdragon 845 mobile platform with CPU clock speed of up to 2.8GHz, paired with Adreno 630 GPU, and offers 6GB/8GB of RAM. Samsung S9+ (SDM845) stepped down from the first place of last month and ranked third with an average Antutu score of 265132. Meanwhile Samsung S9 (SDM845), Samsung S9+ (Exynos 9810)and Samsung S9 (Exynos 9810）also entered the top 10 and ranked fifth, eighth and ninth respectively. Other high-performance smartphones in May that break into the top 10 also include Sony Xperia XZ2 Compact (263991, #4), Sony Xperia XZ2 (261451, #6) and Xiaomi MIX 2S (259940, #7). In general, all the smartphones on this month’s top 10 list have got an average Antutu score of over 210,000. With more new smartphones hitting the market, there will be more new entries in our top 10 list, including Xiaomi 8 which was recently launched in China, and Asus ROG Phone, the gaming phone of ASUS, both of which boast an Antutu score of over 300,000. For more information about the ranking list, please visit Antutu official website or download AnTuTu Benchmark and check in the menu of “Ranking”.